Pyramiden is a Russian ghost town in the Arctic, which is a compelling enough description for me to sign up for a visit immediately, and as a result, I went in relatively unspoiled. I had been imagining some kind of polar Chernobyl; but where Pripyat is a time Bomb, Pyramiden is a time capsule. In retrospect, this should not have been surprising. A former mining settlement, the great upheaval here was socioeconomic, not apocalyptic. And the forces of decay play out differently this far north. There are no weeds to overrun yards, no vines to choke walls, no trees to topple through roofs or smash windows. Instead, there’s just the slow scouring of arctic weather – but mostly, it seems the cold preserves more than it destroys. The mines here were almost unique in that you have to go uphill rather than deep underground to reach their entrance; some 400m above sea level, in fact. I say almost, for there is another set of mines like this – just along the fjord in Longyearbyen. 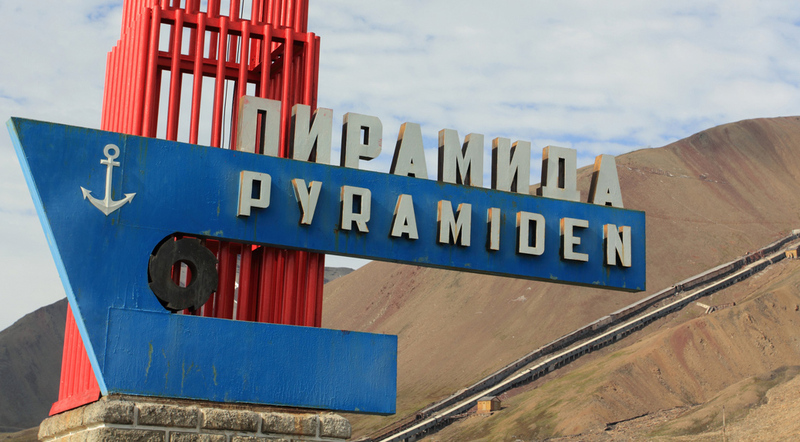 Like those mines, Pyramiden was never quite financially viable; and also like those mines, that was never quite the point, with mining activity a useful route to a territorial claim. Originally a Swedish settlement (from whence the name), it was sold to the Russians in 1927. The Second World War caused it to be evacuated in 1941, but once re-settled, it operated continuously for over half a century. However, after the fall of the Soviet Union it could not long survive the new economic realities, and the population began to disperse – accelerated in 1993 with the closure of the school and departure of families. After an aviation tragedy and mining accident claimed over 160 lives between them in 1996-7, the final order to shut down and clear out came in 1998. The last permanent resident left in October of that year, and Pyramiden was completely abandoned by the turn of the millenium. Since then it has officially been a wilderness area, albeit one that happens to contain buildings. Re-re-settlement began in 2007; that first year only two hardy souls over-wintered. With a year-round population of eight a decade later the residents are, as Sasha drily noted, optimistic about the future. There’s no intention to resume mining activities, and so a symbolic last tonne of coal sits in a mine cart at the entrance to town. The actual last tonne was extracted in March 1998 and did rest here for a while, but so many tourists have helped themselves to a sample that Sasha and co have to periodically top it back up (no problem, he says; they have shed loads of the stuff). Today is unusual in that the governor of Svalbard and head of Trust Arktikugol, the mining company which still owns Pyramiden, are holding a summit – Sasha isn’t invited to these, so he doesn’t know what is discussed. As a result, the helipad is occupied; generally this only occurs once a month, for a delivery of post and supplies from Barentsburg. Otherwise, the only real contact is with those who visit by boat. There is no phone service here, save for a magic rectangle on the dock where an accident of geography bounces enough signal from Longyearbyen to allow fleeting access. It won’t support a call, but twice a day Sasha heads down to wave a phone around and hopefully receive the guest list for the hotel (also administered from Barentsburg). As a last resort, there are satellite phones for use in emergencies; but Pyramiden is pretty firmly off the grid. This then, is another of the Arctic paradoxes I kept encountering on the trip. For on the one hand, this is clearly the most remote place I have ever visited – an official ghost town, all but cut off from the world, and the northernmost point I have ever set foot. But on the other, I’m here on an organised tour with a few dozen other people, the weather is pleasant enough that I’ve abandoned my coat, and the place looks in surprisingly good condition – some buildings are in better shape than ones I pass on my commute each morning! Our tour began with a quick safety briefing, which essentially amounted to “keep up, and don’t get eaten by a polar bear which could be lurking around any corner and has far more right to be here than you do”. Alarmingly, whilst my guides around Longyearbyen related tales that were years (or, for the deadly ones, decades) old, polar bears had been spotted here as recently as March (and there aren’t that many people around to do the spotting). Thus warned, we set off past the most recent building. Standing in front of the hotel, the single men’s dorm – known as “London”, dates from 1989. A little further along, and in similar good shape, is “Paris”, which was home to unmarried women (unlike the early days of Longyearbyen, the Russian company towns were not men-only). To most of the windows were attached what looked like air conditioning units – surely a strange choice for the Arctic. In fact, these were storage boxes, which were used as fridges or, for the eight months of winter, freezers; an approach I am familiar with from my student days! Our route took us next to the former hospital – a fully equipped facility in its day, whereas now Sasha can only rely on basic first aid locally. Organised religion never quite made it to Pyramiden – the plot across from the hospital is empty save for an orthodox cross, marking the site of where a chapel was planned but never constructed. A precarious bridge led us to the only street to officially carry a name – although they went all out, dubbing it the sixtieth anniversary of the Great October Socialist Revolution street. Unsurprisingly, the locals went for something simpler, calling it the Champs Elysees, on account of it being wide… The street slopes, with the view downhill dominated by Nordenskiöld; at the top, the world’s northernmost statue of Lenin is locked in a staring match with the ice. His view also takes in a large lawn; both soil and grass were imported from the most fertile sources in the USSR (likely the Ukraine) to pull-off this unlikely feat of arctic beautification. This imported stock served farming efforts well, although curiously Svalbard reindeer refuse to recognise it as food and still do not graze upon it. Just behind Lenin is the cultural centre, the only (unoccupied) building we were able to access the interior of. Whilst it’s clearly seen better days, and won’t be hosting a sports tournament or theatre production any time soon, it’s still in decent condition structurally – and the plants, whilst thoroughly dead, never quite rotted. Certainly, we weren’t warned to avoid any particular sections, although I’m not sure to what extent health and safety regulations extend to a Russian arctic wilderness. The excellent sightlines (and Lenin’s watchful gaze) meant that we could also wander the main street a bit to collect photos. This is the centre of Pyramiden – to one side are the oldest surviving wooden buildings (from the 1940s), whilst on the other is the oldest stone structure (built 1959) – the blueish hued canteen. With no kitchens available in the dorms, this was the only place to get regular meals – but the food was free and available almost around the clock. At the end of the street is the accommodation block for families – known as the ‘crazy house’ due to the children playing in its hallways, it has fittingly become the main nesting spot for local birds, continuing the tradition of noisy youngsters! Not quite 79 degrees in reality, but still the furthest north I’ve set foot! Eventually we made our way to the hotel, where locals and visitors alike reside – it’s one of only two buildings with power and running water. Sasha lives on the second floor, whereas most (more important, as he put it) live higher up – this became particularly relevant when a polar bear once broke in through a first floor window via some external steps! It made its way to the bar in search of food – not finding any there, it consumed a case of beer instead, before making its way to the kitchen (but fortunately not up to Sasha’s hallway). A specialist team had to be called in from Longyearbyen, who were no doubt thrilled to be roused at 3am for a bear hunt in the arctic winter. Fortunately the helicopter engine scared the bear away, and the policy is not to pursue for a kill – after all, this is really their turf. Instead, the window was boarded up to avoid a repeat performance.